If you only have a few categories and images, it may be easiest to install the latest version of JoomGallery on your target website and recreate the categories, images and configuration manually. November 2013 Update: JoomGallery have provided a new script for migrating JoomGallery from Joomla 1.5 to Joomla 3.x and the following procedure works equally well for migrating JoomGallery from Joomla 1.5 to Joomla 3.x including Joomla 3.2. First use the jUpgrade or SP Upgrade tool or similar to migrate user ids from 1.5 to 2.5, if needed. Copy the three JoomGallery image folders from the source website to the target website using cPanel File manager or FTP or similar. This step is important if you wish the Joomla 1.5 version of the website to retain a copy of the images in the meantime as the migration script moves rather than copies. NOTE: Import the database tables into the target database using a different Joomla prefix to the target Joomla database. Download and install the migration script via the standard Joomla installer: http://www.en.joomgallery.net/downloads/joomgallery-for-joomla-25/extensions/migration-scripts/migration-from-joomgallery-157.html or there is an equivalent script when migrating to Joomla 3.x. In the target website Site -> Global Configuration -> Site, set the website to offline mode. Click on 'Check' for the migration tool to check whether a migration is possible. Address any problems. Once all entries are green you can start the migration by clicking the 'Start' button. A "Please Wait" message is displayed. This may take some time. Don't interrupt the process, but wait for an error or success message. Errors are written to the migration log at /logs/migration.mvc2acl.php. Create a menu item for the gallery in menu manager so you can check that categories and images etc have migrated successfully. Reset any non-default configuration options (especially upload permissions which is different in Joomla 2.5) as configuration is not migrated. You may need to transfer some images manually. Take the website out of maintenance mode. Uninstall the migration script from the target website. Delete the tables with the different prefix imported into the target website database. Delete the image folders of the old gallery. The Webilicious ® website has finally been updated to Joomla 2.5. It's refreshing to be doing some web design and web development on my own website which has been neglected for a while! I am intending on blogging more, and will now have one less excuse! 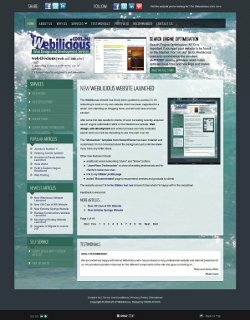 After some first rate results for clients, I'll soon be testing recently acquired search engine optimisation skills on the Webilicious ® website. Web design, web development and similar phrases are hotly contested search terms so it will be interesting to see how well I can do! The "Momentum" template from RocketTheme has been installed and customised. I'm not convinced about the background yet so let me know if you have any better ideas. The website scored 7.4 in the Nibbler test tool at launch time which I'm happy with in the meantime! Update: It's now scoring 8.7 since validating some code in the RSS feed and adding a printing stylesheet.